Jussie Smollett HOSPITALIZED! Chicago Police Department Confirms Brutal, 'Possible' Homophobic & Racist Attack By MAGA Supporters. 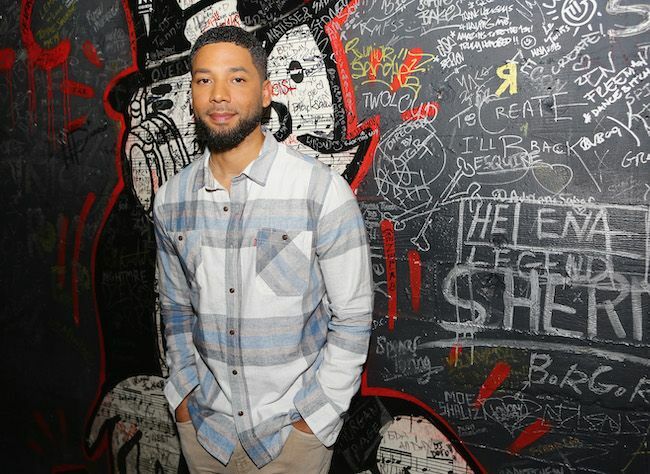 "Empire" star Jussie Smollett has been hospitalized after a brutal attack this morning in Chicago. Authorities have confirmed it was very likely a hate crime. Details inside. As Jussie Smollett flew into Chicago from NYC late last night - after being delayed for several hours on the plane - he posted that he was headed home. Right after his post, he was attacked by two unnamed assailants, according to police. Chicago Police Department spokesperson Anthony Guglielmi sent out a statement to media today (Tuesday) describing an attack on "a cast member of the television show Empire." The hit Fox show films in the city. Other credible sources have confirmed it is indeed Jussie Smollett. The statement reveals that Jussie, 36, was walking to Subway around 2AM since he was hungry after a very long travel, when two people approached him, reportedly yelling homophobic & racial slurs. The verbal attack then became physical battery as the offenders beat him in the face and poured a chemical substance on him. A noose was also put around Jussie's neck at one point. More details from TMZ allege the assailants were two white men wearing red MAGA hats & ski masks who said to him, "Aren't you that f****t 'Empire' n****r?" . They also supposedly yelled, "This is MAGA country." The site reports Jussie suffered a fractured rib during the brutal attack. The offenders fled the scene and Jussie was transported to Northwestern Hospital. He is thankfully in Good condition after this abhorrent incident. One source reports he has been released from the hospital. Polics still say "potential" hate crime because of legalities and investigation of the facts is still in progress. But it's quite clear this fits the bill if even a portion of the report is confirmed as true. Jussie's good friend and co-star, Gabby Sidibe, posted a few hours after his post that "everything is terrible", but she didn't specifically say this was in regards to Jussie's attack. I want to be positive but everything is terrible and to be fair, that’s not even my fault. There's a good chance it's related as the timing coincides with the timing of the attack. 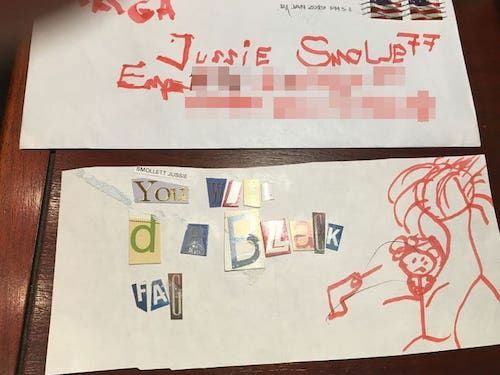 Letters, marked with "MAGA," were reportedly sent to Fox Studios in Chicago threatening Jussie's life 8 days prior, according to ThatGrapeJuice.net. It's unclear if he was made aware of this or if it's related to the attack. It wouldn't be a stretch to believe the attack was targeted as the suspects reportedly covered their faces, had a chemical substance on hand to use on him, caught him right as he was leaving Subway at 2AM, and knew exactly who he was. Police are currently sifting through video and other evidence to find the suspects. All of our thoughts, prayers and hearts go out to Jussie after this completely disgusting attack, and we're wishing him a speedy recovery! NEXT: Mary J. Blige Brings 'Phenomenal Woman' Taraji P. Henson To Tears As She's Honored With Star On Hollywood Walk Of Fame!